Written by Admin on February 5, 2019 . Posted in News. Free event THIS Thursday, February 7th, at 5pm Chester County OIC is hosting the final “Let’s Talk Coatesville” event, tackling the topics of education and jobs. Dinner and childcare are both provided! No reason to miss this event! The Brandywine Health Foundation wants to hear your voice. 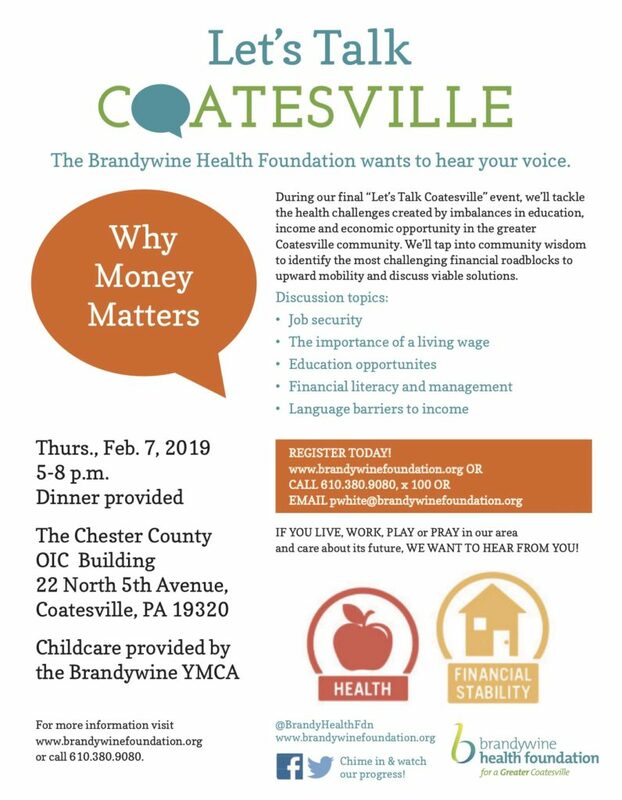 During our final “Let’s Talk Coatesville” event, we’ll tackle the health challenges created by imbalances in education, income and economic opportunity in the greater Coatesville community. We’ll tap into community wisdom to identify the most challenging financial roadblocks to upward mobility and discuss viable solutions.